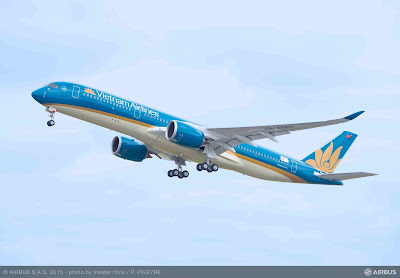 Aviation Updates Philippines - A week after the Airbus A350-900 XWB's visit in Manila, Vietnam Airlines' first Airbus A350 XWB completed its first flight from Toulouse, France yesterday. The A350 carries the airline's blue and gold lotus livery. Vietnam Airlines' first A350 will now undergo the final phase of production, which consists of configuring the cabin, and more test flights. The airline is the first Asian carrier and the second in the world to operate the next-generation aircraft, the Airbus A350 XWB. Vietnam Airlines ordered 14 Airbus A350; four are leased from AerCap and ten on order from Airbus. Airbus boasts the A350's capability of consuming 25% less fuel, lower maintenance costs, and emissions. The aircraft has more space for its passengers in all classes due to its wider fuselage compared to the Boeing 787. The Airbus A350 made a sales pitch in Manila and Taipei last month. The aircraft was lauded for its levels of in-flight comfort and more personal space in all classes. "There will be a need for us to get more long-haul aircraft for expansion to North America, Europe," National flag carrier's President and Chief Operating Officer, Jaime Bautista told journalists. "Of course we will study it very carefully," Bautista said, when asked if the airline is interested in the A350. Meanwhile, Cebu Pacific Air seems to be less interested of the A350 as the airline does not need its long-range capability. 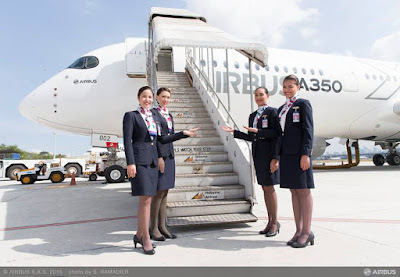 The budget airline currently operates six 436-seat Airbus A330-300 aircraft that is capable of flying up to 7,750 nautical miles. "I think the fleet strategy always follows the network strategy," Cebu Pacific Air Chief Executive Officer, Lance Gokongwei said. "The A350 is very ideal for long haul. We don't have any long-haul routes at this point that require this range." The A350 XWB is Airbus’ all-new mid-size long range aircraft family and the newest member of Airbus' leading wide body family. The A350 XWB is the world’s most modern and efficient aircraft family, setting new standards in terms of flight experience for passengers, operational efficiency and cost-effectiveness for airlines. The A350 XWB had received 780 Firm orders from 40 customers at the end of April 2015.